Theory of Mind (ToM) or mentalizing refers to the ability to attribute mental states (such as desires, beliefs or intentions) to oneself or others. ToM has been argued to operate in an explicit and an implicit or a spontaneous way. In their influential paper, Kovács et al. (Science 330:1830–1834, 2010) introduced an adapted false belief task—a ball detection task—for the measurement of spontaneous ToM. Since then, several studies have successfully used versions of this paradigm to investigate spontaneous ToM. This paradigm has, however, been criticized by Phillips et al. 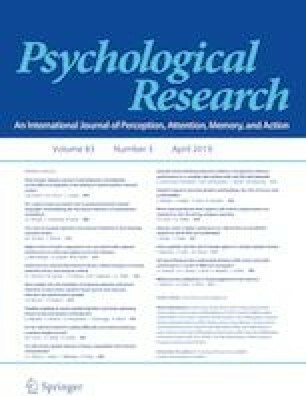 (Psychol Sci 26(9):1353–1367, 2015), who argue that the effects are fully explained by timing artifacts in the paradigm, namely differences in timing of the attention check. The main objective of the current study is to test this attention-check hypothesis. An additional aim was to relate the findings to autism spectrum disorder (ASD) symptomatology in our neurotypical sample, as ASD has been linked to deficits in spontaneous mentalizing. We applied an adjusted version of the paradigm in which the timings for all conditions are equalized, ruling out any potential timing confounds. We found significant main effects of own and agent beliefs on reaction times. Additionally, we found a significant ‘ToM-effect’: When participants believe the ball is absent, they detect the ball faster if the agent believes the ball would be present rather than absent, which refers to the original effect in the paper of Kovács et al. (2010), taken as evidence for spontaneous ToM and which was contested by Phillips et al. (2015). Our findings cannot be explained by the attention-check hypothesis. Effects could not be associated with ASD symptoms in our neurotypical sample, warranting further investigation on the link between spontaneous mentalizing and ASD. The online version of this article ( https://doi.org/10.1007/s00426-019-01181-7) contains supplementary material, which is available to authorized users. This work was supported by the Special Research Fund of Ghent University (project number BOF.DOC.2015.0096.01). This work was funded by the Special Research Fund of Ghent University (project number BOF.DOC. 2015.0096.01). All procedures performed in this study involving human participants were in accordance with the ethical standards of ‘The Ethical Committee of the Faculty of Psychology and Educational Sciences of Ghent University’ and with the 1964 Helsinki Declaration and its later amendments or comparable ethical standards. This article does not contain any studies with animals performed by any of the authors. Deschrijver, E., Bardi, L., Wiersema, J. R., & Brass, M. (2016). Behavioral measures of implicit theory of mind in adults with high functioning autism. Cognitive Neuroscience, 7(1–4). https://doi.org/10.1080/17588928.2015.1085375. Kovács, Á. M., Kühn, S., Gergely, G., Csibra, G., & Brass, M. (2014). Are all beliefs equal? Implicit belief attributions recruiting core brain regions of theory of mind. PLoS One. https://doi.org/10.1371/journal.pone.0106558. Kulke, L., von Duhn, B., Schneider, D., & Rakoczy, H. (2018). Is implicit theory of mind a real and robust phenomenon? Results from a systematic replication study. Psychological Science. https://doi.org/10.1177/0956797617747090. Nijhof, A. D., Bardi, L., Brass, M., & Wiersema, J. R. (2018). Brain activity for spontaneous and explicit mentalizing in adults with autism spectrum disorder: An fMRI study. NeuroImage: Clinical, 18, 475–484. https://doi.org/10.1016/j.nicl.2018.02.016. Nijhof, A. D., Brass, M., Bardi, L., & Wiersema, J. R. (2016). Measuring mentalizing ability: A within-subject comparison between an explicit and implicit version of a ball detection task. PLoS One. https://doi.org/10.1371/journal.pone.0164373.